Work on the cabin started with the careful disassembly of the chimney by Marcello Masonry and restoration of the east bedroom roof and walls by Strada Baxter Design Build. A story in the Shelter Island Reporter featured the daily canoe commute by the craftsman as well as the cabin's survival of hurricane Sandy. The paper also ran a photo of a visit by Traci Christian of the NYSOPRHP. 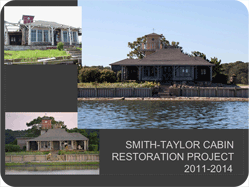 Architect Andre Tchelistcheff and his team along with Structural Engineer Robert Murray have begun creating the design and specifications for the restoration of the Smith-Taylor Cabin on Taylor's Island. Their initial visit by sailboat to the Island to survey the building was covered in an article by the Shelter Island Reporter. 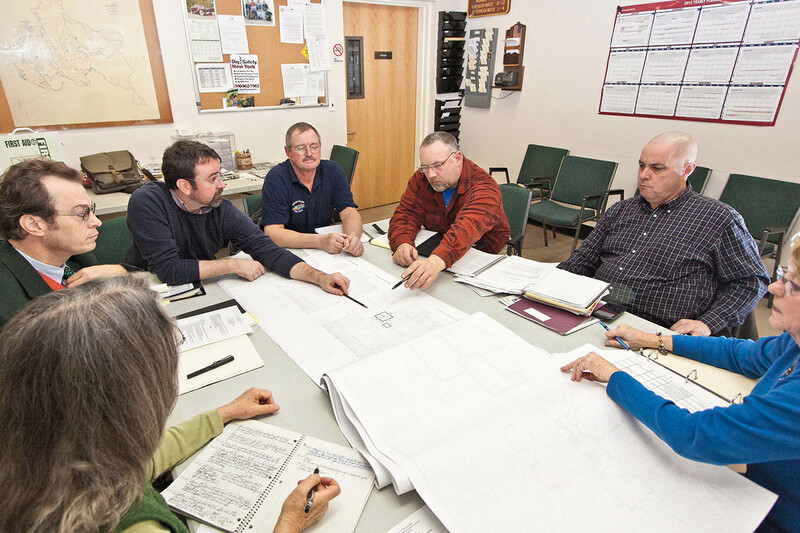 The architects met with the Foundation, Committee, Town Board Liason, and Town Highway Superintendent to refine the plans. The plans were presented to the SI Town Board in anticipation of a presentation to the NYS Department of Parks, Recreation, and Historic Places. The meeting was covered by the Shelter Island Reporter. 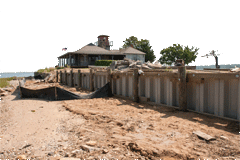 On June 7, 2012 the Town of Shelter Island published the Cabin Restoration Notice to Bidders. On July 31st the Town Board authorized a contract with Strada Baxter Design Build, LLC of Amagansett. 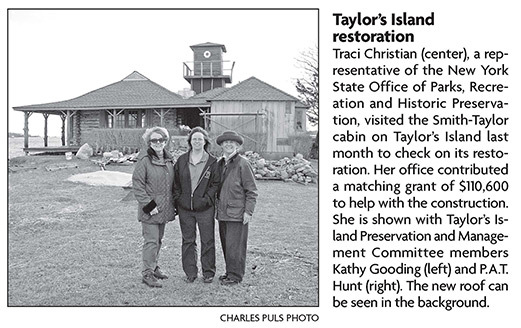 The contract for carpentry work, log wall restoration, windows restoration and a new roof was reported in the Shelter Island Reporter. The Group for the East End and the Garden Club of Shelter Island joined forces on a very windy day to restore native plants on Taylor's Island. The planting included American beach grass, beach goldenrod, groundsel, and prickly pear cactus. 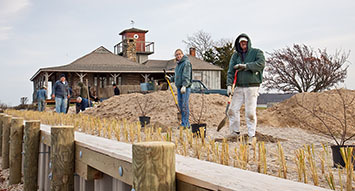 The Group for the East End and Alfred Kilb, Jr. provided the plant material and the planting was covered in an article by the Shelter Island Reporter. Planting continued as Taylor's Island celebrated New York State's first I Love My Park Day on May 5th. Taylor's Island Gets $110,600 Matching Grant !!! The Smith-Taylor Cabin, listed on the National and New York State Registers of Historic Places, will receive $110,600 in matching funds from the New York State Office of Parks, Recreation and Historic Preservation. 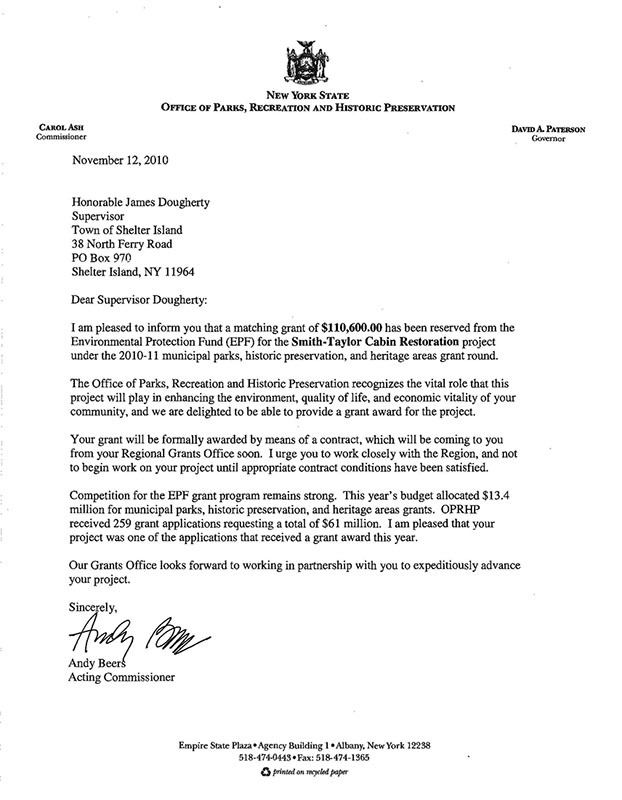 The grant to restore the Cabin was awarded after three tries. 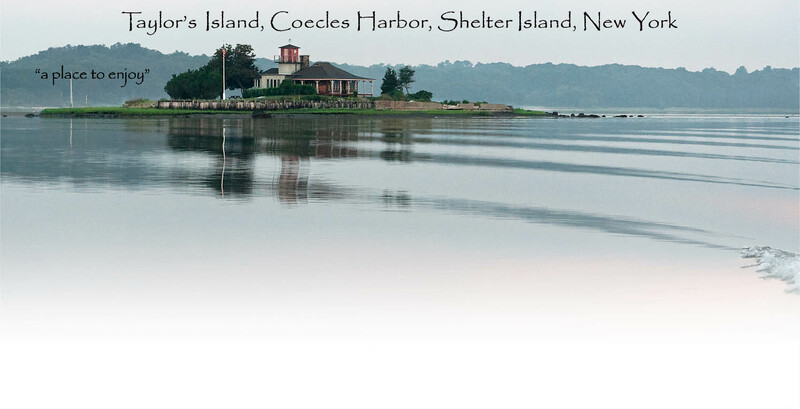 The Taylor's Island Preservation and Management Committee is grateful to the Town of Shelter Island's grant writer, J. O'Connell and Associates, and in particular, Tom Lajewski, for helping to secure this funding from the Environmental Protection Fund. The match for this grant will come from your generous donations, monies left by Mr. Taylor for the care of the property, volunteer labor, and in kind services from the Town Highway Department. 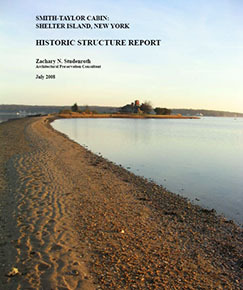 In 2007, the Town of Shelter Island received a Preserve New York grant to compile an Historic Structure Report on the Smith-Taylor Cabin. This report is a roadmap for the restoration project. 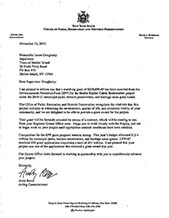 Thank you to all in our community for your support of the grant application, including your letters and petitions, as well as endorsements by Congressman Tim Bishop, State Senator Ken LaValle, and State Assemblymen Marc Alessi and Steve Englebright. With money from the Taylor's Island Foundation, the S.I. Town Waterway's Fund, the endowment from Mr. Taylor, and T.I. Committee budget, the northwest bulkhead is complete and the Smith-Taylor Cabin is safe. The northwest bulkhead, originally made of concrete, had broken in several pieces. Stout Construction began work on August 18th. The S.I. Town Highway Dept. provided backfill and volunteers planted native vegetation to finish the project. Costello Marine completed the Taylor's Island northeast bulkhead in December 2009.The original concrete bulkhead was built by F.M. Smith in 1911.The bulkhead protects Mr. Taylor's grave, the cabin porch from erosion, and Coecles Harbor from upland spoil. Costello Marine generously donated the materials for the project. Larry Tuthill and the Town Committee began the permit application process with the NYS DEC in 2006. The permit was issued in 2008. Thank you George and Larry! Architectural Preservation Consultant Zach Studenroth created an Historic Structure Report as a first step in planning the restoration of the Cabin. This project was funded by Preserve New York, a grant program of the Preservation League of New York State and the New York State Council on the Arts. The Shelter Island Reporter ran this story. 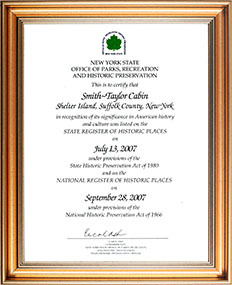 On July 13, 2007 the Smith-Taylor Cabin on Taylor's Island was officially listed on the New York State Register of Historic Places and on the National Register on September 28, 2007. 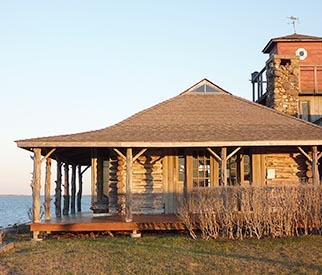 The NY State Historic Preservation Office stated "The Smith-Taylor Cabin is historically and architecturally significant as a surviving example of a seasonal seaside bungalow residence." The cabin is the only remaining structure in its original location built by Francis Marion Smith, the "Borax King," a transportation and planning visionary. 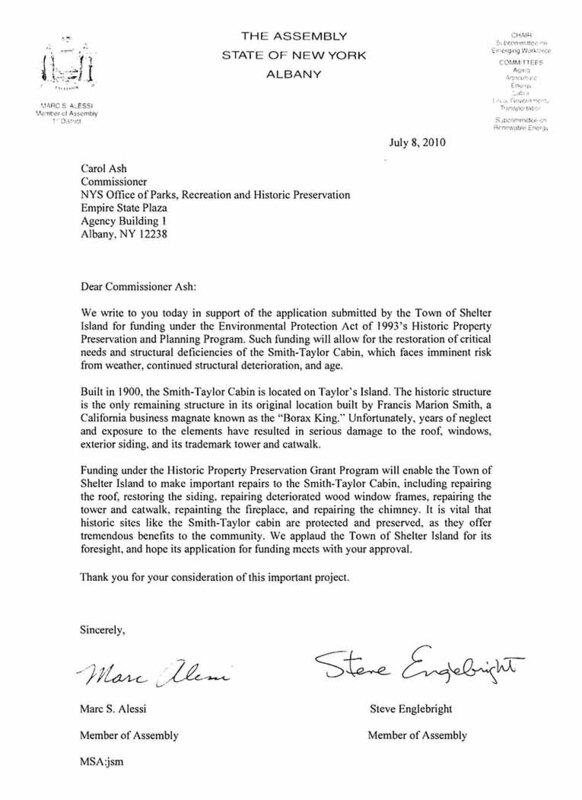 This designation is the result of the continuing support of the Shelter Island Community and Town Board, numerous personal letters, and the effort of the Taylor's Island Preservation and Management Committee. The Taylor's Island Foundation prioritized the restoration of the porch deck (for safety) and the porch roof (to protect the cabin).The Foundation funded these repairs which spanned 2007-08.